Going to talk more about Asp.Net Core newly introduced feature of view components for reusable UI. View Component has the following features. Renders a chunk rather than a whole response. Is typically invoked from a layout page. View Component represents in two parts. 1. View Component class typically derived from ViewComponent. 2. Return result as HTML typically a View. The View Component class is similar to Controller class, it might have POCO. A View Component class can be created in any of the following ways. Let's create a View Component class so it's easy to understand. 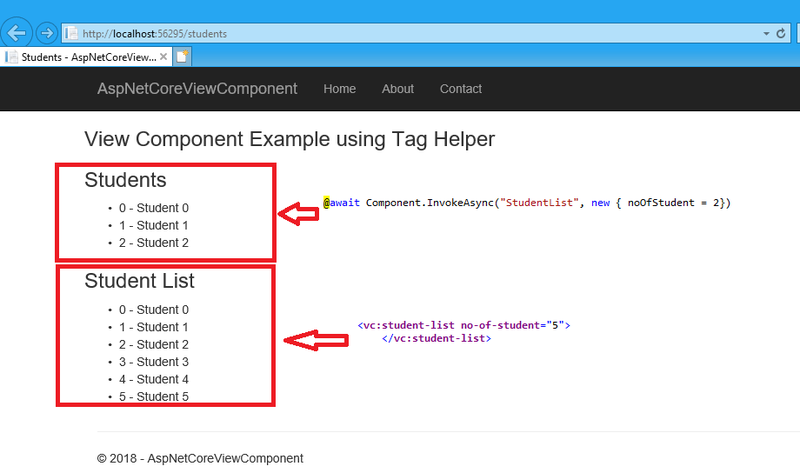 You can see a name of the class is StudentListViewComponent and it's inherited from the ViewComponent abstract class. ViewComponent attribute can be used to change the name of the view component. For example, if we have the class named XYZ and want to set view component name to StudentList, this can be done using ViewComponent attribute. The default view name is "Default" for the view component. It means that our view name must be "Default.cshtml". We can assign a different name to the view of view component and this name must be passed to view method. Tag Helper was introduced in ASP.NET Core 1.1 and higher. For tag helper, Pascal case class and method parameter are translated into lower kebab case. We have to use "vc" element () to invoke the view component as a tag helper. It can be specified as follows. Mostly, view components are invoked from a view, but you can invoke them directly from a controller method. While view components don't define endpoints like controllers, so we can implement controller action that returns ViewComponentResult. The complex view component might require returning non-default view based on some condition. In the following example, ViewComponent will return StudentList view if the noOfStudent value is greater than 4. StudentList.cshtml view created from Default.cshtml view and its look like following code. Both the syntax used to generate out as well conditional render view also handle in this output. Everything is exceptionally open with an exact clarification of the issues. It was extremely instructive. Your site is helpful. Much obliged for sharing!